As the recurring ad for the World Cup keeps saying, “It only takes a second!” Like all emerging and existing American soccer fans, I leaped for joy when Landon Donovan’s clutch goal settled into the net with just over three minutes of injury time left in the critical game with Algeria. Facing a heart-breaking tie that would have eliminated the US from advancing, the US led a lightning-fast counterattack that produced the pivotal 1-0 victory. No matter what happens in the final round of sixteen, the American team has exhibited some important lessons on optimism in challenging times. “This team embodies what the American spirit is all about,” Donovan said after the game. “We had a goal disallowed the other night. We had another good goal disallowed tonight. But we just keep going. And I think that’s what people admire so much about Americans. And I’m damn proud.” So are we all. 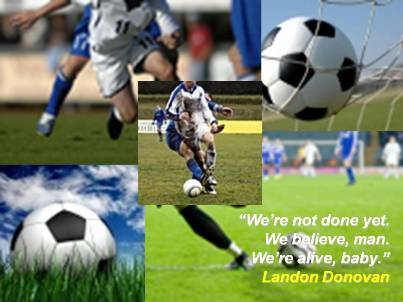 Like Donovan and the team, optimists never give up. As I write about in The Optimism Advantage, optimists stay future-focused on going up, around, over or through any obstacle to win the game–whether that is soccer or the great game of life. They are action oriented. They let go of setbacks and get busy making the best of the next opportunity. You can’t get stuck in the rearview mirror when all the opportunities are out the front window. It’s not how many times you fail; it’s how quickly you bounce back to try again. “We can moan about it, or we can get on with it,” Donovan asserted. “And we kept going, and we believe.” The only thing that could defeat them was if they ran out of time. That’s what winning optimism is all about. The US coach Bob Bradley observed, “In this last cycle, guys have grown, taken leadership roles. As a team we’ve grown stronger; we’ve had experiences where we’ve been hardened. These guys put a lot into it. They never quit.” Amen! It was but another late goal by the US team who came back to tie both England and Slovenia in earlier games. As I stress when I speak on optimism, optimism is not motivational hype; it is earned through a track-record of overcoming obstacles. The more obstacles you overcome, the more you believe that you can do it again. Thanks for giving us a lesson we can apply in the game of life. Never give up. Let go of the past and keep fighting. Win or lose in the next round, thanks for the example you have given us. You should be proud of your efforts.